Test Editor Tris Best // Second Testers Maurin Rottenwalter & Joe North. Photos Tris Best // Test location Overcombe & Portland Harbour. When we last tested crossover boards of this size a couple of years ago, the first few designs influenced by the compact concept (initially seen in wave boards) were beginning to come through. Today, more than half the lineup on test here has a connection to the ‘short and parallel’ concept, but are they becoming commonplace for the right reason? In other words, do the new designs definitively offer performance benefits or is change happening purely for change’s sake? We sent our test team in to find out. This test was originally published in the January/February 2019 issue. The first elephant in the room to discuss is the name for this category. 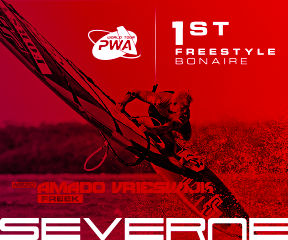 Freestyle wave or crossover or freewave, call it what you will, the principle remains the same amongst the brands. The idea is that, above all else, these boards should be a lot of fun on the water. 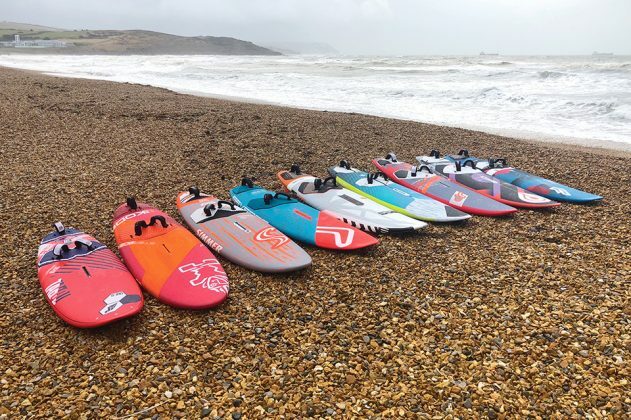 Whatever your preference, be it high wind blasting, bump-and-jump, freestyle or wave sailing, these boards should adapt to the conditions, the fin(s) and sail it’s partnering … and the riding style of the user, to provide a master-class of making the most of their time on the water. It is certainly a hard balance to get right, and invariably a board’s credentials will tend to lean towards one discipline or the other, depending on the interpretation of the shaper and the feedback his R&D team provide. Your own focus should then be on the type of performance you crave. Do you really want a “go anywhere, do anything” platform, or do you tend to sail in predominantly coastal slop, for example? In which case, are you simply looking for more dependable float and drive than you get from a dedicated wave board, to make the most of the muddled conditions? For those of you unfamiliar in the nuances of the compact concept (and even if you are), it is probably worth recapping the ins and outs of it here. First appearing in the wave board sector back in 2016, the idea has had slow growth in many other disciplines ever since. The most visually obvious feature is the compact board’s outline. Short, narrow and with parallel rails, it keeps width in both tail (up to around one-foot-off) and shoulders, giving it a decidedly boxy silhouette. The established benefits read like a wish list of desirable performance attributes – more stable in all conditions; earlier planing; faster on every point of sail, particularly upwind; it feels smaller to manoeuvre on the water and in the air; and finally, more snap and response through a back-foot riding style on the wave. The list is long and exhaustive, so why haven’t compact designs spread like wildfire and rendered traditional rounded-outline designs obsolete? Initial designs of a revolutionary new approach are often a little too extreme for the consumer market. For 2019, the middle ground between contemporary and tradition has been explored. Extreme designs have been throttled back, whilst others have adopted some, but not all, of the compact shaping elements. These subtle changes make a big, big difference – in the case of fins and stance positions for example, we’re talking a matter of millimetres. Time within a design process is a great leveller. You see it in every industry, where the product of the second phase in a design cycle is so much more refined than the groundbreaking first. Fix the bugs and issues that only really make themselves apparent during longevity testing and a concept will really begin to flourish. Looking at the modern designs initially, the Fanatic FreeWave STB’s shape hasn’t actually changed from when we tested it a couple of years ago. What has altered though is the position of the fin boxes … and what a difference it has made. The board is still not particularly fast, but its playful nature is spellbinding. The Tabou, JP and Quatro all possess elements of ‘compact’ design, whether it be more parallel rails (JP), a shift in stance towards the tail (Tabou) or maintaining width in the tail (Quatro). Marrying them with more conventional attributes, the resulting performances are impressive, with both the Freestyle Wave and 3S Plus being incredibly adaptable machines, whilst the Power is an ace for making the most of less than ideal wave conditions. The RRD and Simmer come from a very different approach, both possessing the rocker-lines of more straight-line oriented ideologies. Both are incredibly easy and flattering to sail, whatever the conditions. At the other end of the spectrum is the Goya One, a large wave board if ever there was one, with the ‘get up and go’ to be enjoyable in challenging cross-on conditions, yet the grip and fluidity to really own the marginal float and ride session, even if the waves are pumping. The Starboard is largely an unchanged design and exemplifies the essence of versatility in a classic shape. That leaves the Severne Dyno – a board that quickly grows on you and demonstrates just how diverse a performance the modern compact shape can provide. We have to say that this test has exposed the true virtues of the modern ‘compact’ design pathway. It is undoubtedly here to stay … and more than this, is undoubtedly worth embracing.